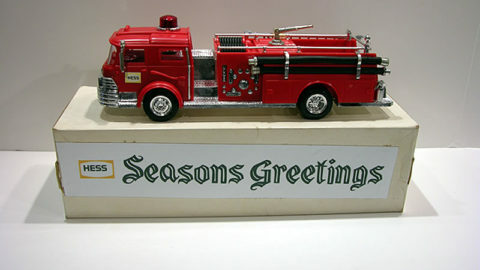 Set is complete with the truck, box with all packing, red velvet base & battery & seasons greeting card. The truck measures approximately 13″ in length. 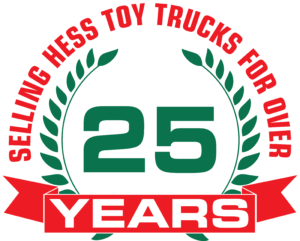 We were recently contacted by a long time Hess collector to sell his entire collection of trucks. This 1967 Hess Red Velvet Tanker was well cared for by the owner who just wanted his collection to go to a new home. 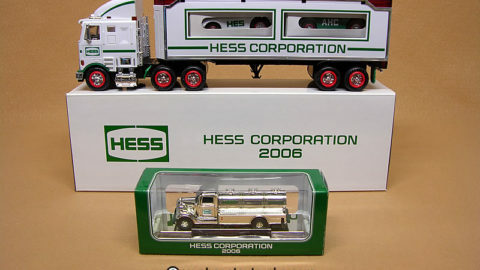 This truck comes in a white box top with a “Red Velvet” base for the bottom unlike any of the other Hess trucks. The truck and decals are in excellent condition (see pics). All the chrome parts are present and in excellent condition with bright color. The battery compartment is clean and the lights have been checked and are in working order. The red velvet base is in excellent condition and original (see pics). The top of the box has bright graphics & in excellent condition with some slight paper loss in one area (see pics). Comes complete with the battery card which is also in mint condition. Both inside top inserts are included and in mint condition (see pic). The truck measures approximately 13″ in length. Check out our other listings for other Rare Hess trucks such as the 1969 Amerada Hess Tanker & others from this same collection! 1969 Hess Woodbridge Tanker Truck – Very Rare!